My wife and I are not ones to rise early with a big happy smile, at least by nature. No, we would gladly stay up to 3am watching movies, drinking, eating, or in some other way having fun; and then slowly drag ourselves out of bed somewhere well after 10. But, as much as we have tried, our 2 year old boys will not do the same (the sleeping in part). What's more, they have also inherited what I believe to be a dominant trait: being a little grumpy in the morning. So needless to say, in order to prevent some tragic passing, there are some mornings where getting out of the house as soon as possible is a top priority. And since we have to take them with us, we usually go out to breakfast. Weekend breakfasts usually involve eating way too much, and there are times we go out so early that sitting down (sitting is also often a problem with 2 year olds) to a big meal is not at all appealing. I know this may shock my regular readers (all three of you), as for the most part I enjoy all forms of gluttony no matter what the meal, but sometimes I don't want to eat all that much. That is how we ended up at Rise and Shine bakery in the Highlands a few weeks ago on a Sunday morning, just as they were opening the doors. 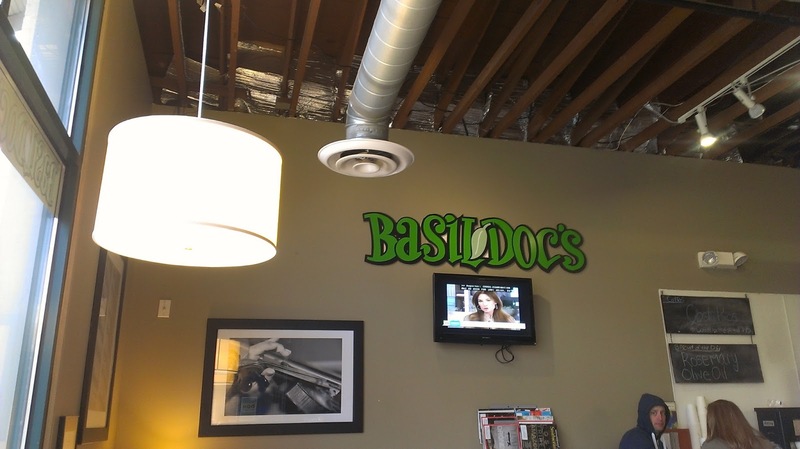 Rise and Shine is housed in Basil Doc's and has done like other biscuit and pizza joint combos and opened for the first part of the day when most people aren't in the mood for pizza. I have praised the pies of Basil Docs before and the role it plays in a recently lapsed tradition of watching the major league all star game on my porch. 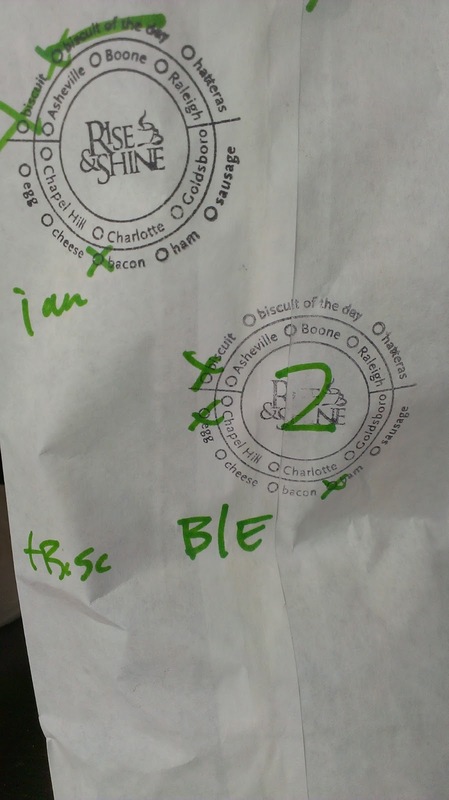 Their daytime biscuits are equally tasty. And not that big. And priced just right. The biscuit of the day was Rosemary Olive Oil and was light, flaky, rich and moist. The subtly of the rosemary was lost a tad under my bacon and eggs that I smashed inside, but the whole combo was just right washed down with a slurp of Pablo's coffee. My entire family chowed down--but not too much--and was noticeably merrier following our meal. 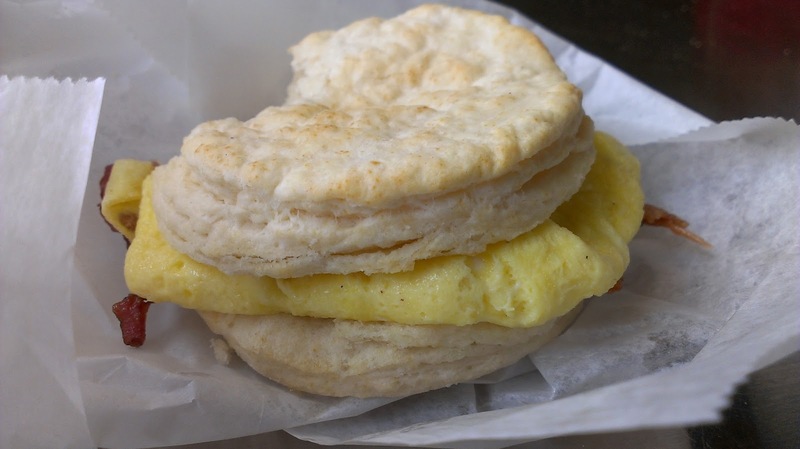 So if want to get out for an early meal any day of the week, but don't want that post-Sunday brunch stupor-of-a-feeling--or if you just want a decent biscuit--then Rise and Shine is the place for you.